Pavers, often referred to as “paving stones,” are a popular outdoor flooring option in California and around the United States. Similar to tiles, pavers are manufactured in a factory in specific shapes, sizes, and colors and arrive ready for installation. Pavers are most commonly installed over a compacted base of soil and sand. Since they are primarily used outdoors and are subject to weather, sunlight, cars, and foot traffic, pavers require a proper seal. 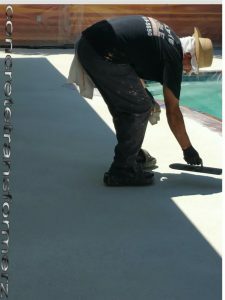 The best time to apply sealing is just after installation or restoration. Concrete & Marble Transformerz offers paver repair, reconstruction, and replacement in Los Angeles and the surrounding areas. We will inspect every project thoroughly and will work with you to find paving stones that fit your budget. Call Concrete & Marble Transformerz today for a free estimate and find out why we’re a Top-Rated Local® restoration company!